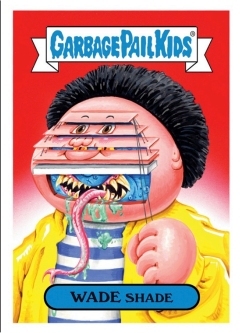 The Garbage Pail Kids 2015 Sticker Card set includes 162 cards. 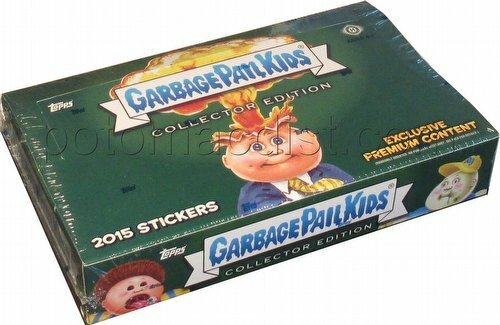 There are 132 brand new characters (66 each with A&B names), 10 All-Star stickers, 10 Mascot stickers, and 10 Baseball cards. Parallels include Black (1:2 packs), Hobby-Exclusive Silver (1:24), and Gold (85 per subject). Inserts include 8 Hobby-Exclusive Bonus cards, Hobby-Exclusive Die Cut sketch cards, Artist Autographs, and Printing Plates. Collector Edition exclusives include Metallic Red Parallels (1:1), Canvas Texture Parallels (1:1), Sepia Parallels (1:48), Character Back cards (1:24), Patch Relics (10 subjects/90 of each), Die Cut Sketch cards, and Baseball Variants (10 subjects/1 per case).